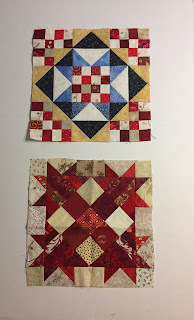 It's time for another block for my Sunday Sampler quilt -- made from Bonnie Hunter's (Quiltville) scrappy blocks published by Quiltmaker's 100 Blocks. Winston Ways (on top) was published in Volume 3 of the Quiltmaker's 100 Blocks and is seen all over Pinterest made into awesome quilts. When several of the WW blocks are made, they nest very nicely together and form secondary blocks.